I find the issue of running a restaurant 24 hour/day interesting. The Wall Street Journal (April 30, 2013) writes that “fast-food chains are hanging a lot of hopes on night owls and early birds.” With a lean economy squeezing their sales, thousands of restaurants are extending their hours to try to get more people through the door. About 45% of McDonald’s 14,100 U.S. locations are now serving customers around the clock, up from about 30% in 2005. Dunkin’ Donuts has doubled its number of 24-hour restaurants over the past decade to nearly a third of its 7,000 U.S. outlets. Taco Bell implemented a breakfast menu for the first time last year, and today 825 stores open between 7 a.m. and 9 a.m., instead of the usual 10 a.m.
For many franchisees, extending hours is an alluring idea, since it lets them bring in more revenue without boosting fixed costs like rent. It can also simplify other operations issues: Outlets that stay open around the clock, for instance, can eliminate procedures for opening and closing the restaurant. But the practice doesn’t always bring big payoffs. Even though fixed costs don’t rise, there are added expenses such as higher utility bills and extra pay for hourly employees working the graveyard shift. Simply finding people to work those hours can be a struggle. “It is always difficult to get people to work overnight. It’s just contrary to the body,” says one consultant. Meanwhile, the boost in sales can be meager. Consumers still prefer to eat at fast-food joints during traditional hours. 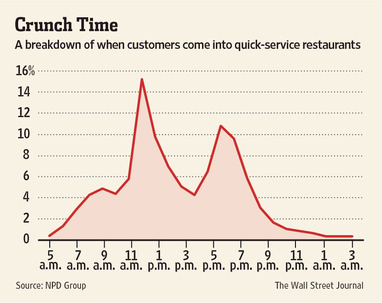 Noon to 1 p.m. is the busiest time of day for quick-service restaurants, accounting for about 15% of customer visits last year. In contrast, the hours between 9 p.m. and midnight represented just 6% of visits, and the hours from 1 a.m. to 4 a.m. less than 1%.